If ever there was a doubt regarding how seriously our country and state consider our sports arena then the handling of the National Games, arguably the most important & the most erratic sports event in our country, is a classic example. Setting the drama open, the crack began when Kerala was 'awarded' the privilege to host the biennial (?) event in 2010. The jubilant Minister for Sports Mr. Vijayakumar went straight on record stating that we're going to conduct the best ever version of the Games and that Trivandrum would be the venue. Then he told that as much as 1000 crores would be spent on developing infrastructure in the city and suburbs, including a Games Village. Outlandish ideas of constructing a Beijing model birds-nest stadium, constructing a few greenfield indoor stadia, swimming pools and revamping a few other sports facilities in the city and what not! Then someone had the bright idea of using the Central Govt fund to develop sports infra all around the state. So from one city- one district affair, the National Games 2010 was ballooned into an all-Kerala festival, meaning the event will be held in all the 14 districts of the state spanning 38,000+ sq kilometers!! Note: The National Games scheduled in Ranchi in 2008 has not happened yet. Explains a lot, doesn't it? Ok so, what about our Birds nest stadium minister? The one you promised to build in Karyavattom (or was it Vattiyoorkavu?) with a 50,000-soul capacity... And we were promised a greenfield Indoor Stadium, Swimming Pool renovation and so on, apart from a Hockey Stadium in Kollam, Velodrome in Calicut, Indoor Stadium in Cochin. Anything happening? Kerala Government is moving ahead with the preparations for conducting the 35th National Games allotted to the state as per schedule in May, 2010. 'Kerala has no anxiety.We are going ahead with our preparations for the conduct of the game as scheduled', Kerala Minister for Law and Sports M Vijayakumar said. On the delay in completion of infrastructure facilities, he said the renovation of the existing stadiums will take only six months and it is not a problem. What does that mean? There wont be any bird's nest, no velodrome, no games village, no nothing... The Govt is hell bent on conducting the event in 2010 May itself when they can't even clean up the University Stadium before that. A second opportunity to conduct such an event will come after the Halley's Comet is halfway into its flightpath and is this wise to waste this chance? The system is to be blamed here. Shortlisting the venue just 15-18 months before an event demanding massive infrastructural and logistical works is the first Himalayan blunder; courtesy the IOA blockheads...With the 34th Games in Ranchi scheduled this year end, the next version within a time-span of 5 months was the next big joke. And the State Govt completed the circle of bloopers by falling flat on its face after the overdecorated announcements and promises during the initial euphoria. Even though Jharkhand defaulted in their arrangements for the National Games, the state made use of the generous funds made available by GoI to facilitate the construction of a mega-sports complex in 325 acres just outside Ranchi city, which would contain venues for almost all the events viz Athletics, Football, Basketball, Volleyball, Gymnastics, Kabbadi, Kho-Kho, Swimming, Shooting, Cycling, Tennis to name a few. Jharkhand is also developing a state of the art Games Village through a public private partnership model just adjacent to the Mega Sports Complex. The Khelgaon or the National Games Housing Complex is also getting ready to house the 6000+ participants and officials. And Kerala has decided to utilize the unoccupied ghostly flat complex of Housing Board in Balaramapuram! The website set up for the 35th National Games in Kerala lists out the venues for the showcase event. Its miserable! Here it is... As per the current plan the University Stadium is going to be the main venue, lol, it will take some work by the snake charmers to drive the reptiles and mongoose away from the gallery, fill up the rat-holes and cut the man-high grass in the south field. The only positive I see from that list is the Pirappincode Aquatic Complex will be realized, or will it be another Bird's Nest-in-the-air? The political and bureaucratic climate is all positive for Kerala to muscle in some much needed facelift for our Sports facilities. With an all-powerful group of ministers at the center and influential members in Executive its a once in a lifetime chance to pull in some noteworthy investments to construct International standard sports facilities. It would be atrocious for the Govt to settle down for a mediocre event conducted on existing rusty crumbling facilities. Just 110 crores have been allocated to Kerala for the mega-event and much of this is planned to be spent on tunneling out an underground parking lot for Central Stadium. Its time we stood up and shout "NO", because Kerala has been second to none in producing talents who have upheld our country's image on the World stage. The eagerness on the part of our Sports Minister for the May 2010 date is not to be misinterpreted. It has nothing to do with the development of the state's sports. 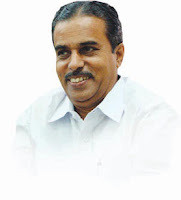 The next Kerala Assembly elections is due in 2011 and M.Vijayakumar (pic) wants to satisfy his party head-honchos by conducting the games before 2011, just to score a few useless points to present before the electorates. Analyzing the present performance of Mr. Vijayakumar and his bunch of commies led by Comrade Achuthanandan, it is most likely that the whole lot will end up where they belong: the opposition benches. So honourable Minister, please don't rob us off the promised developments which the Center has proposed. Please don't succumb to a less-than-ordinary event in our old dilapidated dustbowls. We know that Kerala Govt has "aanamutta" in hand to build new stadiums and you are going to commit a crime against the sports lovers of the state by going ahead with your political game-play. Is there nothing to it more than politics? Or is it all part of the big-game?